With nRelate often appearing in the list of best related article plugins, this has forced many people to search for a new product, perhaps something just as simple or something with a few more options. Regardless of which bucket you put yourself into, here are some options worth considering, when looking for something to replace the nRelate related articles plugin. This plugin is currently my choice as a replacement for nRelate, although I am considering some other options. The good thing about WP-Thumbie from my point of view is its simplicity, both from a setup point of view, as well as output. Having said that, it may be a little too simple for some users. Similar to nRelate there are few options to worry about as far as controlling the results displayed as “related articles”, but there are some nice options for the general user including the number of articles to display, the size of the thumbnail image to display (which seems to pull from the first image found in the post itself), whether to display the list in vertical format (recommended for users with little or no CSS / HTML experience) or raw format gives you a simple unordered list (this is my choice, which I then style using CSS). You can also choose to exclude certain categories from appearing in the list, as well as choose to display a post excerpt and also whether to show the related articles on Pages as well as Posts. In my opinion, this seems to be a pretty close like-for-like replacement for nRelate, and if you are not too concerned with being in tight control over which related articles will appear, then this could be a good choice for you. Be aware though, it has been at least a couple of years since this plugin was updated, so it seems support for it would be sketchy at best. 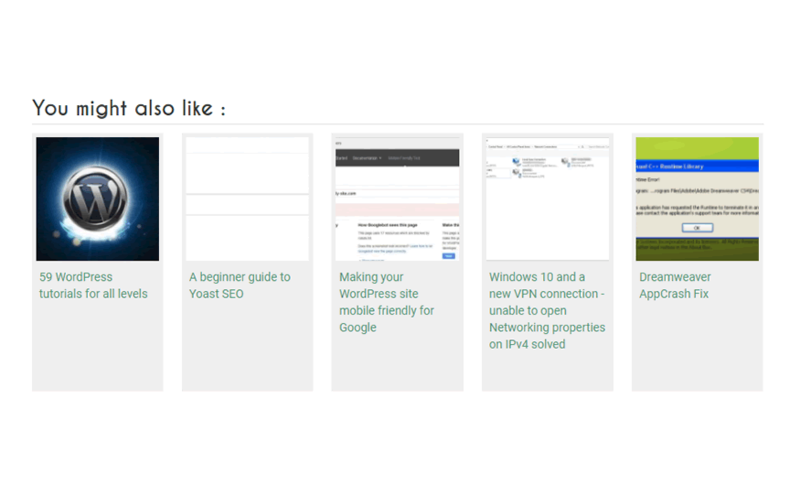 YARPP is certainly a nice option and has a loyal following, but where it differs from nRelate (or WP-Thumbie) is that it relies on your posts having Featured Images set. This might typically not be an issue for you, but if you don’t have a featured image on each blog, it will show a default image of its own choosing (if using the thumbnail view) although you can set the default image if using the list view. There are a few more options within the settings of YARPP that allows you to have tighter control over what results should be returned, such as putting extra weight on title, body content, categories or tags. You can also specify that a blog must have at least one tag or category in common, meaning the resultant list of related articles is truly more relevant to the reader. Admittedly I have not used this particular plugin as much as perhaps I should, and I may yet change the plugin I am currently using as a result (mostly because, as mentioned earlier, development on WP-Thumbie seems to have ceased). I didn’t spend a great deal of time testing this plugin, and although I was getting results returned, for the life of me I couldn’t control what thumbnail image was being used. I had both a featured image, as well as an image inserted in the actual posts, but I kept getting back the random image selected. No idea what I have been doing wrong! Other than that, once again the options were pretty simple and straight forward, and as I said I was getting results returned easily enough. This plugin I have running currently on a site or two and have had much success with it, though it is not for the feint of heart. Many advanced options here, so this plugin is not your typical set and forget style of related articles plugin. It takes a bit of getting used to but more or less you can create your own set of rules as far as what gets displayed in the list, and different to automatically dropping in a list of articles at the bottom of your page or post, I tend to use a shortcode. There are quite a number of preloaded presets, but you can also build your own custom ones. You can also load in your own HTML both prior and after the list, so if you feel like dipping your toes (or diving right in) to some more advanced options, then Advanced Post List might just be up your alley. This plugin gives you full control, post by post, over what related content you wish to display at the end of each article. Far from being a set and forget option, this one is more or less completely manually controlled by you. This plugin acts as an extension to the Meta Box plugin, and is reliant on this plugin also being installed. Once installed though, you can select the related articles you wish to list, right from within the post edit screen. If you want to take full control over what you want to display, this could be the plugin for you. Whatever your choice, good luck with finding something to replace nRelate related articles plugin. Feel free to add any other recommendations to this list, in the comments below.